The South Fork of Seven Mile Canyon is located off of Highway 313 near Moab, Utah. 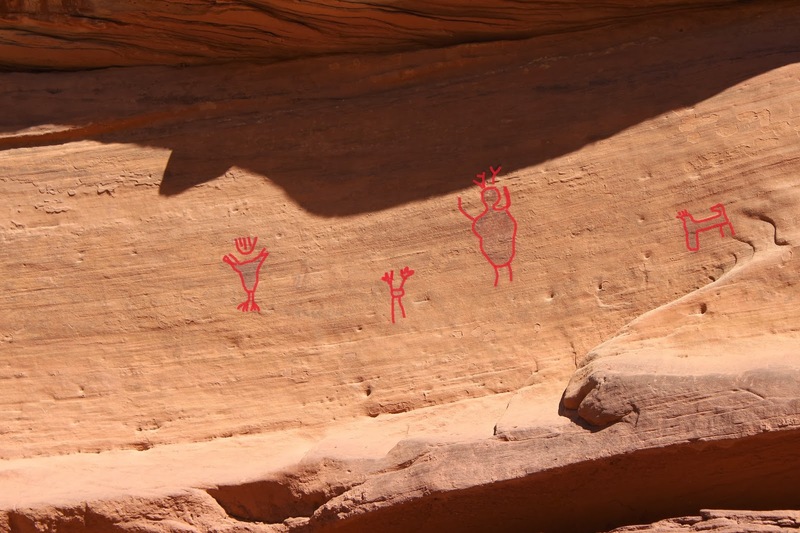 Seven Mile Canyon has many petroglyph and pictograph sites that date back as far as the Archaic Period. The canyon is easy to hike with little elevation change. For this post we hiked into all the side canyons and even all the way out of the canyon at one point. To visit just the rock art sites that we point out would only require about a 6 mile round trip hike. 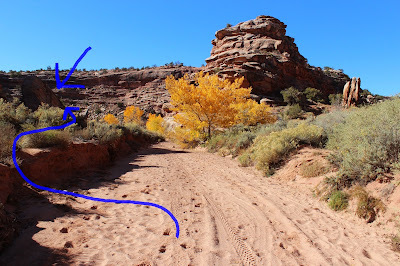 Seven Mile Canyon isn't an official BLM trail so it doesn't have an official trailhead with a trail sign. This post begins from the same location that many other hikers begin by measuring 2.3 miles from the Canyonlands/Dead Horse Point turnoff on Highway 191 onto Highway 313. Plenty of parking is available inside of the gate. There are usually cows in here during the spring and summer so be sure to keep the gate closed. This route begins by following an old double track that cuts through the thick brush. Once through the brush the route enters the sandy wash where the hiking is pleasant and easy. Continuing along the main wash will lead into the south fork of Seven Mile Canyon which is on the left in this photo. A hundred yards or so from the split of the north and south forks of the canyon at mile 0.6 from the trailhead there is a brown mylar trail marker on the right side of the wash that has a red portion that says 'Closed'. The sign isn't referring to hikers. Look for the faint trail near this sign and follow it over to the east facing cliff. There are a few faint petroglyphs at this location. If you follow the trail along the cliff back to the north you will find a few more. After getting back into the wash continue following it for about another mile. If you have the time you might consider following any trails that you see leading over to the cliffs. Maybe you will find something that we missed. We scanned a lot of the cliffs with our binoculars but we were bound to miss something. 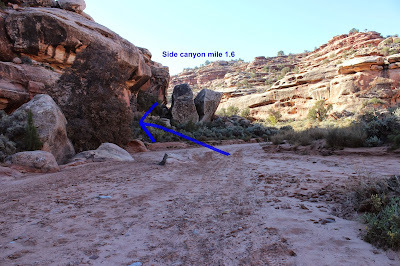 At mile 1.6 there is a side canyon that splits off on the left. We explored that branch as far as we could and didn't find anything that was particularly interesting. It was a little fun scrambling over and around some huge boulders and a big chunk of agatized wood but that is about it. Just before the canyon splits look at the cliff on your left to see some unusual pictographs. We highlighted these images on the computer but the ones on the left were already white and show up easily from the wash. They have a real Mesoamerican look to them. We scanned through hundreds of Zapotec, Omtec and Maya hieroglyphs without finding anything exactly like them. We did find components of Zapotec that are very similar though. Judging from the black mineral stain that is covering the center portion of the panel these images have been here a long, long time. We highlighted the images on the computer several times and depending on which photo we used they came out with subtle differences each time. What we have rendered here may not be perfectly accurate. Besides that, some of it is very faint and hard to make out unless the light is just right. In some photos you can see something peeking out from within the black. 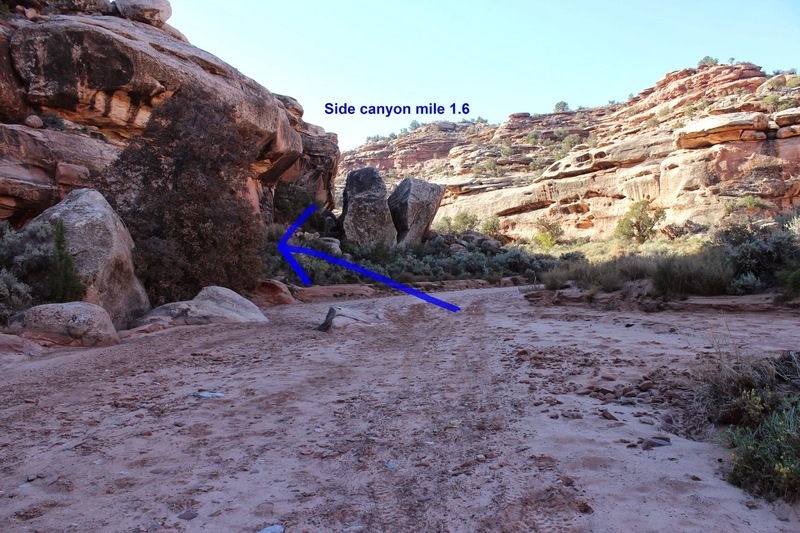 If you skip the side canyon and continue hiking in the main wash until you are about at the 2 mile point from the trailhead you will come upon another mylar marker with a closed sign on it. Follow the side trail through the sticker weeds and watch for a softball sized cupule in the cliff. 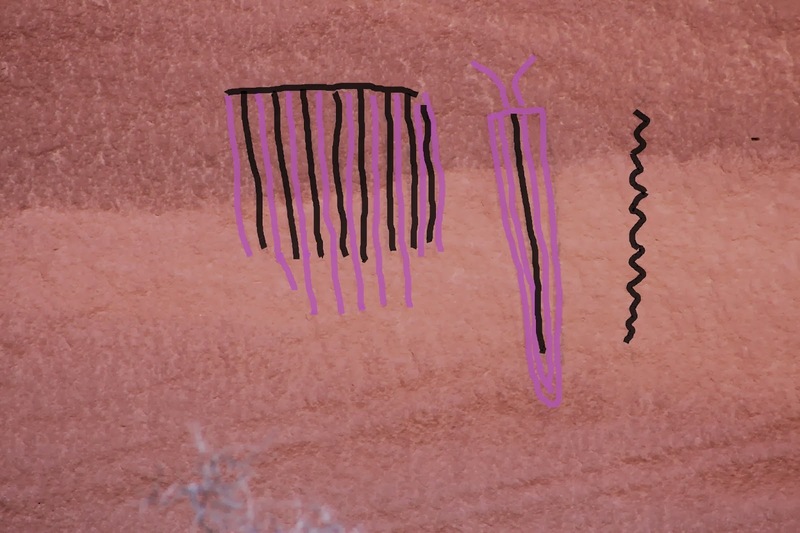 Inside the cupule is a small pictograph. This is the type of spot where offerings of corn or seeds may have been placed. Very cool! Be careful not to disturb the sand or other contents. An archaeologist can have it tested for components like pollen that can provide valuable information. A little further down the cliff keep an eye out for some red pictographs. There is a stack of rocks below them that you can stand on to get a better picture. I outlined on the computer one of the pictures that we took with red to make them stand out more. Notice that the image on the left has bird feet, wings, and a feathered head. 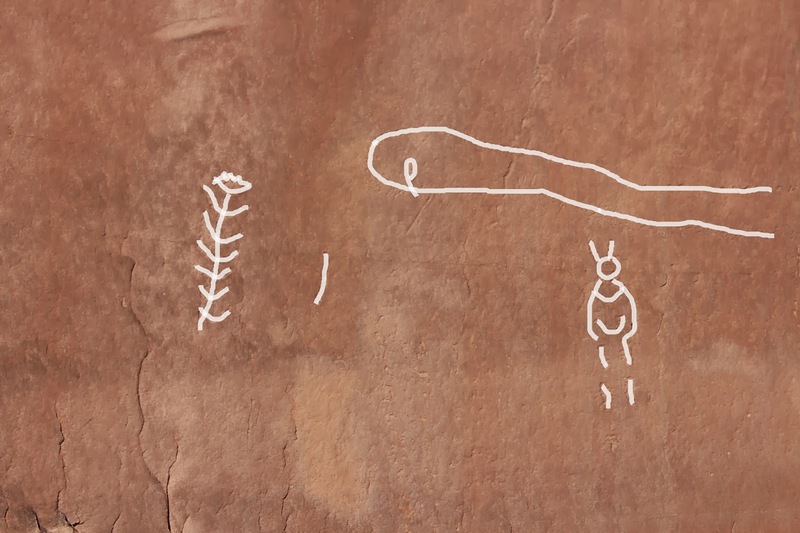 It is both damaging and illegal to chalk rock art sites and it is no longer necessary with a good camera and a computer. I don't always do a great job outlining the images but the only reason that I do it at all is so they show up better on this website. The canyon splits again at about the 2.9 mile point with the main branch bending around to the left. Just around that bend is another couple of pictographs up on the cliff above a bench. There is somewhat of a trail that leaves the wash just before you get to the bend. The right fork of that trail leads up to the pictographs on the bench and the left fork leads to an old road that comes all the way out on top. If you hike around the bend you can look up and see the pictographs and pick a different trail from that point if you want to get a closer look. The purple and black pictographs are faded so I outlined them on the computer for this post. This image is off to the right in a more protected place on the cliff and hasn't faded as much. We found one more panel a little further away. Continue hiking until you come to a fence across the wash where ATV's and dirt bikes aren't supposed to go any further. The pictographs are on the cliff on the left side of the wash. When these images were painted they would have shown up like a big billboard for anyone passing by. 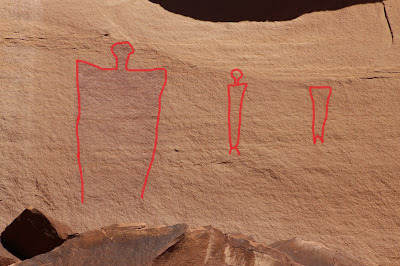 The one on the left is reminiscent of the big images in Horseshoe Canyon. As you can see there is a lot of room to park here. 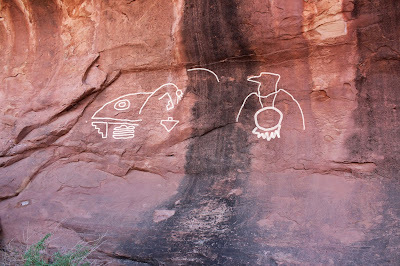 Across the highway and about 1-2 hundred yards west there is an interesting petroglyph site. If you continue west on Highway 313 to a pullout on the right side of the road that is across from the fork in the canyon you will be at the Intestine Man site. Some people that hike into Seven Mile Canyon prefer to park there. This trailhead seems easier and more direct but we have parked at both in the past. If you would like to see it for yourself then all you have to do is 'Take a hike'.